The tenth and twenty-fifth days of the lunar month are significant times for practice. The outer reason is that according to tantric teachings, on these dates, the heroes and yoginis from the twenty four sacred sites naturally gather to bless the yogi. The inner reason is that the meditator’s subtle channels, winds, and essence drops naturally gather around the central channel on these dates, so they are a superior time for meditation. The secret reason is that if a yogi performs a puja with the particular samadhi of the secret mantra, there is especially great merit. Another reason why the tenth day is significant is its association with Guru Padmasambhava. Many in Tibet consider that Padmasambhava was extraordinarily kind to the Snow Land of Tibet. He himself said that in the future he will actually come on the tenth day of every lunar month to bless his followers. The Tsechu Lama dance arose 800 years ago from the pure visions of Guru Chöwang. There are long and short versions. The long is called the black hat dance, and the short the white horse dance. According to historical sources, this practice first came into the Kamtsang lineage at the time of the Eighth Situ Panchen Chökyi Jungne, who instituted it at Palpung monastery. Later during the time of the Fourteenth Karmapa Tekchok Dorje, it was introduced at Tsurphu Monastery, one of the seats of the Karmapa lineage. Situ Chökyi Jungne had learned the dance at Bentsang Monastery in Netong, so the present tradition is a continuation of the Netong tradition. 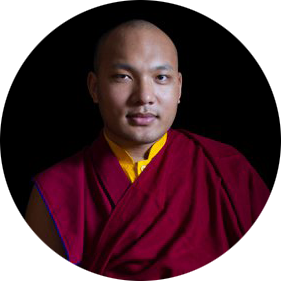 In 1959, the Sixteenth Karmapa Rangjung Rigpe Dorje escaped to India, where he instituted the tradition of the Tsechu lama dance at Rumtek monastery, his seat in exile. Since then it has been preserved there in its entirety as a living tradition. This sacred lama dance with its long history and profound meaning is not like any ordinary dance one might perform. The essence or nature of the dance is recognizing that the nature of all phenomena is the union of appearance and emptiness. One’s body, speech, and mind no longer remain ordinary, and one visualizes oneself as the form of the deity. The dance becomes a way to express this to other people. When a powerful yogi performs the lama dance, he can directly affect the body, speech, and mind of the viewers. All sentient beings have buddha nature, but it is hidden by obscurations. The lama dance is a way to purify these obscurations. Through the samadhi of the three vajras, the expressions of the body, speech, and mind of the deity purify the dancer’s mental continuum. If the spectators, imagining and meditating on themselves as the deity, are also able to view it not as ordinary experience but as an expression of the deity, they will receive the blessings of the wisdom deities—it is no different than if the deities themselves actually came. Seeing the dance implants the seed of liberation within the viewer’s being. According to the Hevajra tantra, the dance eliminates the outer and inner obstacles of the dancers themselves as well as those of the spectators. The dancer gains influence over the world because all that appears and exists is sealed with the stamp of the deity. It is also said that one will easily accomplish the recitation of the deity’s mantra.